Here at Lent Madness HQ, we take brackets seriously. Thus when someone alerted us to the fact that there is some other bracket-style tournament that takes place in March, we thought we’d better take a look. 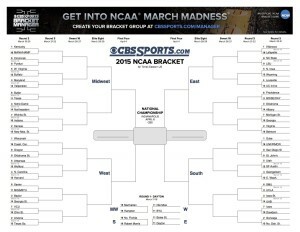 What follows is the Official Lent Madness Bracket Analysis For Tournaments Taking Place During March That Do Not Involve Saints. When you examine the NCAA basketball tournament from a saintly hermeneutic (which is a $500 theological word that young preachers should never, ever, under any circumstances use in a sermon), three categories emerge: The Obvious, The Perhaps, and The Give Me A Break. St. John’s University (Red Storm) — The only question is which St. John. The Baptizer? The Evangelist? Of the Cross? They get additional points for the allusion to Pentecost in their nickname. Providence College (Friars) — The school moniker is a synonym for heaven. Plus they get extra credit for invoking the image of Friar Tuck. Notre Dame (Fighting Irish) — Any team named for Our Lady is “obvious.” Too bad there are no “Hail Mary” plays in basketball. The word “Fighting” is lamentable but Celtic saints (Brigid of Kildare this year) often do very well in Lent Madness so it balances out. San Diego State (Aztecs) — The city is actually named for the 15th century Spaniard holy man San Diego of Alcala, not Juan Diego who made the 2015 Lent Madness bracket. Alas. Xavier University (Musketeers) — This institution is named for St. Francis Xavier, the Spanish Jesuit who was co-founder of the Society of Jesus. Southern Methodist University (Mustangs) — When you put “Methodist” in the name, you are clearly a religious institution. Plus, Charles Wesley is a former Golden Halo winner. North Carolina (Tar Heels) — The Carolinas (north and south) were named for Charles I or England (Carolus is Latin for Charles). While Charles is commemorated by some Anglicans as Charles the Martyr, he is not on the official calendar of the Episcopal Church. His Archbishop of Canterbury, William Laud, however was defeated in the first round of Lent Madness 2015 by Kamehameha. North Carolina State (Wolfpack) — See above. Coastal Carolina (Chanticleers) — See above. BUT they get points for having a mascot that is associated with the thrice-denying apostle Peter. Also, what’s up with so many teams from North Carolina?! University of Louisville (Cardinals) — The city in Kentucky is not named for St. Louis the IX of France. No, it’s named for Louis XVI — who is not a saint. HOWEVER the mascot is named for an ecclesiastical order of the Roman Catholic Church. Virginia Commonwealth (Rams) — At first glance, the VCU mascot would be more at home in Los Angeles or St. Louis where the NFL team of the same name once resided and currently resides. HOWEVER the team is named for the animal caught in the thicket after God tells Abraham to stop the presses and not sacrifice his son Isaac after all. Eastern Washington (Eagles) — They get points because they named their mascot after the symbol of the Fourth Evangelist. Maryland (Terps) — This would be listed under “The Obvious” except that the state is not actually named for the Virgin Mary. Rather for King Charles I of England’s wife Queen Henrietta Maria (Queen Mary). Louisiana State University (Tigers) — Not named for St. Louis (who once appeared in Lent Madness) but rather Louis XIV or France. Kentucky University (Wildcats) — Contrary to popular belief, Kentucky was not named for Lent Madness 2015 participant Thomas Ken. Georgetown University (Hoyas) — Named for neither St. George nor his dragon nor former Golden Halo winner George Herbert, nor Scott’s dog George. Rather Georgetown is named for either George II of England or the town’s two founders — both named George. Duke University (Blue Devils) — It doesn’t matter how many games or titles Coach K has won. Your team is named after (a blue-tinted plural version of) Satan. 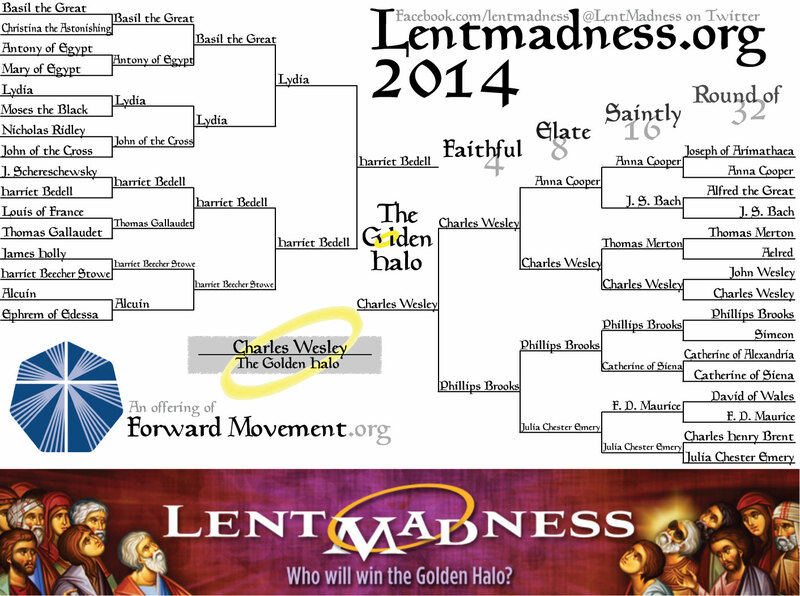 If your Lent Madness bracket has been hopeless busted, you may well decide to fill out the “other” bracket. Go ahead. And if you enter an office pool, we definitely suggest you use this analysis to decide all your picks. Or at least invoke St. Matthias, the unofficial patron saint of gambling (he was chosen to be an apostle by the casting of lots). 58 Comments to "The “Other” March Madness"
Coastal Carolina is in South Carolina, not North Carolina. Go Tar Heels. But Coastal Carolina is in SOUTH Carolina. However, what IS up with all the teams from our neighbors to the north? I follow Lent madness more than basketball except when Valparaiso is in it. (My son plays in the band for Valparaiso University.) Although our mascot may be unpolitically correct you gotta love the knight and shield of character. And yes our chances of winning are slim,but we love our Crusaders. Go Valpo! I am a graduate of the Law School. 1) As a lawyer, I object to calling Valparaiso University’s Nickname “un-politically correct”! It is not intended to remind people of the ills of the Crusades, but rather as a crusader for Christ — as we all should be! 2) Valpo is STILL very much a Lutheran School, which is why I chose to go there. As a Lutheran, I have degrees from a couple of Catholic schools (DePaul BS, Loyola PhD), a couple of nominally Presbyterian schools (Northwestern University MS, Rush University Medical College which is affiliated with Rush-Presbyterian St. Luke’s Hospital in Chicago MD). So when I decided to go back to law school I picked the Lutheran school over a couple of Catholic schools (Loyola and Marquette). 3) While Valpo is a lowly 13th seed, the Champion of the Horizon League, which plays Maryland the #4 seed in the Midwest Regional, from the Big 10, Valpo actually has a better record — 28-5 v. 27-6. Moreover, since I also follow the Big 10 (Northwestern University), I have to say Maryland played the end of the season and in the Big 10 tournament like it already had it made. It didn’t! If Valpo is on its game and especially if Maryland is already looking past Valpo, Valpo can indeed pull off a 1st round upset! GO VALPO! But alas they are in the Midwest Region with the top #1 seed Kentucky, the only undefeated team in the NCAA Tournament! But stranger things have happened in March Madness!!!!! Go Valpo!!!!!!!!! Good points but I think the unpolitically correct part is that the Crusades killed so many non-christians to further Christian beliefs. The irony is that those of us who know Valparaiso University know that it is a very inclusive, peace promoting university with a solid foundation of service and character. Go Valpo! As I said, the Crusaders nickname is not meant to evoke the ills of the Crusades and killing all kinds of non-Christians, but as Crusaders for Christ who evoke Christ’s infinite love and is all-inclusive and peaceful. And the proof of that is that it is the only Lutheran school supported by both the ELCA and the Missouri Synod! Unusual, but true! And Valpo has some incredibly fantastic Christians serving on its faculty, as well as a good basketball team! I would also argue that there is such a thing as a “Hail Mary” in basketball and Valpo proved it possible in the 1998 NCAA Tournament against Ole Miss – https://www.youtube.com/watch?v=2Rm_eAiV4dA. Still known as “The Shot”, it even has its own Wikipedia page – http://en.wikipedia.org/wiki/The_Shot_(Valparaiso_University) – and was parodied in a commercial in the 2013 NCAA Tournament. 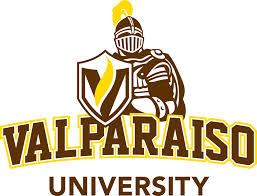 As a proud Valpo alumna, I always cheer for my Crusaders in the tournament and am thrilled at their seeding this year. Go Valpo! I remember that! It would have been a few months before I started Law School there, but I was in the process of applying. And I was going to point out that there was such a thing as a “Hail Mary” in basketball, but I had forgotten about that example! Thanks for reminding me! And Valpo is again a #13 seed, so they can do it again! As I am also a graduate of Northwestern, I also follow Big 10 basketball. NU was within a point of beating Maryland, and it was indeed a very close back-and-forth game! So Valpo can pull off the upset again against the #4 seed Maryland! Go Valpo!!!!! 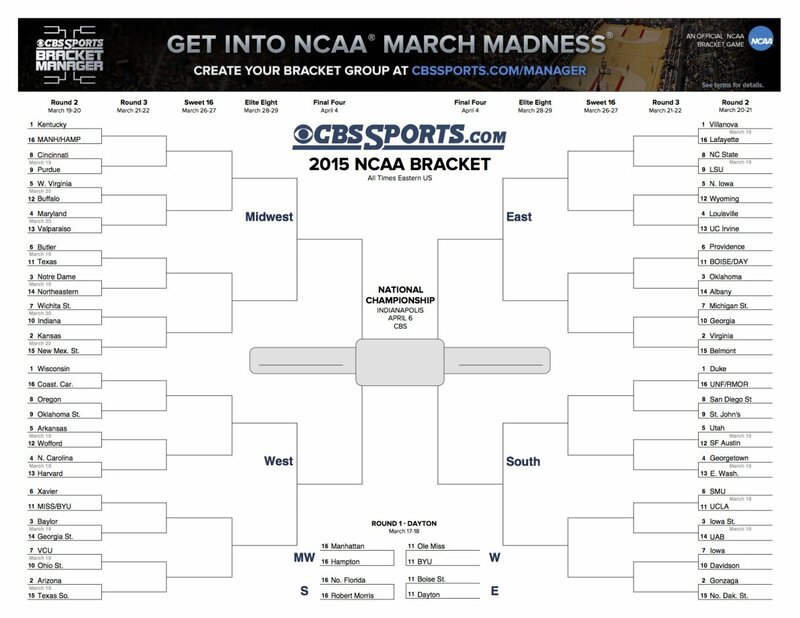 But what about Mammal March madness? Well, there is the saying that “If God is not a Tar Heel, why is the sky Carolina blue?” That might explain the number of NC teams. Yes, but what team in their right mind chooses Baby Blue for their school colors? Sir, if you lived in North Carolina calling UNC’s Carolina Blue colors “baby blue” would be blasphemous. I confess I made I made a similar faux pas, once. Wasn’t last year’s Golden Halo awarded to John Wesley? Not Charles? nope. Charles beat brother John in the first round, and went all the way on the strength of Love Divine All Loves Excelling. University of Kentucky Wildcats, that’s our team! Voted for Thomas Ken this time, but has Friar Tuck ever been considered for the saintly LM? Go CATS!!! Witty! Funny! Informative! Thanks! GO HEELS! What about Gonzaga, a # 2 seed named after St. Louis Gonzaga? See below for the name correction. Gonzaga is definitely a character worth noting. You guys don’t cross the Rockies much do you? True, Charles Stuart, K.M., is not in the current Anglican Kalendar, but according to my sources he was the last person to be canonized by the Church of England, so some of us have a basis for observing 30 January (O.S. — it corresponds to 9 February in the Gregorian Calendar). As a proud alumna of Our Lady’s University, I need to correct you. It is the University of Notre Dame not Notre Dame University. What’s up is that NC is the home of some really great basketball! Go Heels! And I’m behind all those other NC and ACC teams except Duke! For spiritual and not-so-spiritual reasons. In future stick with the saints and stay away from basketball. That is all. Boston’s name has reminded me of a church I visited one time in Cambridge (the one in UK), St. Botolph’s. An info sheet said Boston is a contraction of ‘Botolph’s town’ and even though not on the calendar that I can see, he’s got a feast day. Maybe he could be in next year’s bracket. Another North Carolina school in the NCAA tournament this year is Davidson. Originally founded by Presbyterians to train ministers, it now sends many of the grads to med school and law school. This small school frequently joins the more famous North Carolina schools in the NCAA tournament. In addition, Wofford is in the tournament this year another South Carolina school. Despite my moniker, I am a Davidson Wildcat fan. Gonzaga is named for St. Aloysius Gonzaga. Not on TEC calendar, but definitely on Spokane’s. As a proud graduate of the University at Buffalo, I am thrilled that they made it for the first time to the NCAAs! Go Bulls! Duke Have a devil as its totem, but a royal blue devil, not a red one. The blueness does not suggest fire as red does,, but perhapsjust suggests mischievousness. Ah, youthful spirits. 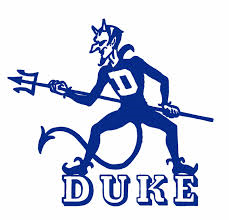 Also note that Duke is located in North Carolina..
Duke may have a devil as its totem… My error. Yuck! Real sports! Get it off! Get it off! Yuck, yuck, yuck! Now, please! Cooties, cooties, cooties! I am so appreciative of all the joyful and zany work that has gone into Lent Madness! Thank you!!!! I am a Lutheran deaconess from Valparaiso University and I was so excited to see Valpo in the March madness. Then when I saw Valpo in this list !!!! Wow!!! Even if questions were raised on the name. My Episcopalian nurse friend and I check in at work everyday to see what saint is advancing and we drag our coworkers at the clinic into the discussions. Thank you for such a fun activity!!!! HOW did you miss the #2 seed, Gonzaga University, named for St. Aloysius Gonzaga? The school even has a web page about him — so surely that counts as an overt saintly reference! Since St. Al isn’t recognized in the Episcopal calendar of saints, he might not be eligible for inclusion in a future Lent Madness bracket — but we in Spokane would love to see him there anyway! Oh Tim, when you bring academic institutions into the mix, you are opening yourself up to endless comments by the partisans and alumni of such places, saintly named or not. For example, as a recipient of a degree from Our Lady’s school in South Bend, IN, I am required by law (maybe Cannon, maybe not) to point out that the said school’s correct official name is THE UNIVERSITY OF NOTRE DAME and never Notre Dame University. The reason it makes a difference is because the FULL official name is THE UNIVERSITY OF NOTRE DAME du LAC and you can now see that du Lac does not follow well if the name is as you stated it. I treated you much gentler than if you had made the error of saying Michigan University instead of The University of Michigan. Trust me – that is a mistake you will never make twice. However, there is no Boom Boom Cannon involved, you probably mean canon as in canon law! Virginia, named for the Virgin Queen, was also the head of the Anglican/Episcopal church. I should think that would boost Virginia right to the top of the list. Certainly, it belongs above those Papists! And as for Virginia Commonwealth……..you need another cup of coffee to clear your head! Relling, I was thinking the same thing concerning that the Virgin Queen was the head of Anglican Church. Being the head of the Anglican Church seems pretty important to all of us. And also, the first record celebration of Holy Communion in the Anglican Church occurred at Jamestown, Virginia. Doesn’t get more Episcopal than that. My FL Gators are sitting this BIG dance out, but I’ll watch and enjoy. So, for those of you whose teams are going to the big dance – good luck. In Maryland we have a description for people and things that are the most obnoxious, having the greatest sense of entitlement, pushing the rules to the edge of the envelope, etc. : [insert name] is the Duke of … Ex. The Pittsburgh Steelers? Oh, they’re the Duke of the NFL; That one presenter? He was like the Duke of the conference. What about the players’ and coaches’ names? Being in the BIG BLUE NATION I want to mention Aaron, Andrew, John, Booker etc.etc.etc. All named for saints in some other heavenly nation. PS Can people of good conscience let themselves cheer against Our Lady? Really? PPS Full disclosure: I myself committed the sin of cheering against Our Lady as recently as Saturday night. Love this. Can’t come up with saintly names around here but basketball is definitely a religion in the midwest and there are rumors that the Kansas University (which goes to the tournament year after year after year) coach walks on water. Actually the Duke Blue Devils are named not for Satan but for a famous WWI U.S. Army regiment. That doesn’t make them saintly but may help make them victorious…. Here is a link to the Duke University archives article “Why a Blue Devil?” They are actually named after a courageous French WWI fighting unit but definitely not for Satan. Oh, dear! Coastal Carolina is NOT in North Carolina, as implied in your comment. And why doesn’t Virginia get points for being named after a virgin? That’s pretty important, don’t you think! You should have had Sibley edit this post! Gonzaga Gonzaga Gonzaga Where is St. Aloyisius? Go Zags (aka Bulldogs)! As a graduate of Southern Methodist – GO MUSTANGS! – which was undefeated against UConn last year yet slighted by the NCAA in 2014, I’m glad that the NCAA has made repented & amends this year. FYI: SMU’s team was originally the Parsons. Also, Onward, Christian Soldiers was originally written as an anti-slavery abolition movement hymn! So remember that the next time you see the names of Saints Fredrick Douglass, Harriet Tubman, et al. somewhere. I went to a high school in Michigan whose mascot was the BlueDevils, so I usually cheer for Duke. However, our colors were navy and gold like the University of Michigan, which didn’t even make the cut this year! I’d say that Georgia State University belongs in the “obvious” category because what Coach Ron Hunter has done with that team is a bona fide miracle! Proud to be a GSU Panther! How could anyone from Forward Movement forget WISCONSIN!? How about some support for the home team…Nashotah is still in WI, I think! e and the Hare….Go Terps! another bracket style tournament? can not , I REPEAT, cannot even compete!!! !